A fast, normal prime designed for Micro Four Thirds mirrorless cameras, the Lumix G 25mm f/1.7 ASPH. from Panasonic is a 50mm equivalent lens featuring a bright f/1.7 maximum aperture for enhanced low-light shooting and depth of field control. One UHR (Ultra-High Refractive Index) element pairs with two aspherical elements to reduce spherical aberrations and distortions for consistent edge-to-edge sharpness and illumination. A Nano Surface Coating has been applied, too, and helps to reduce flare and ghosting for increased contrast and color fidelity. The optical construction also helps to realize a compact overall form factor, measuring just 2"-long and weighing 4.4 oz. Benefitting both stills and video capture, this lens also incorporates a stepping motor for smooth, quiet autofocus performance that is compatible with Lumix cameras' high-speed contrast-detection focusing systems. Designed for Micro Four Thirds mirrorless cameras, this lens provides a 50mm equivalent focal length to represent a normal perspective. Fast f/1.7 maximum aperture benefits working in difficult lighting conditions and also enables extensive control over focus placement for selective focus applications. One UHR element and a pair of aspherical elements help to achieve even illumination and sharpness for consistent performance throughout the aperture range. A Nano Surface Coating has been applied to individual elements to noticeably reduce lens flare and ghosting for greater contrast and color fidelity when working in strong lighting conditions. Stepping motor delivers fast, smooth, and near-silent autofocus performance to benefit both still photograph and movie recording applications. Rounded seven-blade diaphragm produces a smooth out-of-focus quality when working with shallow depth of field techniques. Box Dimensions (LxWxH) 4.3 x 3.3 x 3.2"
Lumix G 25mm f/1.7 ASPH. Lens is rated 4.7 out of 5 by 157. Rated 5 out of 5 by MatthiasLambert from Finally, the micro four thirds nifty fifty equivalent! This is the lens most m4/3 users have been hoping for. It focuses blazingly fast on my EM1 and the signature high contrast and sharp IQ I know from panasonic primes is ever present. It may be a little softer in the corners, and perhaps not as razor sharp as the highly regarded Pansonic Leica 25mm f/1.4, but at the amazing price and offered this is a must have lens for the system. Portrait and street shooters will eat this up, and the close focus distance is ideal for product shots also. Size is larger than the panasonic 20mm f/1.7 but smallerthan the Previously mentioned 25mm. It includes a nice hood that is reversable also. Rated 4 out of 5 by David from Nice Fast Prime for the Price Everyone should have a nice fast prime in their kit and, for the price, this one performs very well. I was looking at some off-brand MFT manual lenses for less with a max f/1.1 for my GH4. A price drop in this lens made me purchase this Panasonic prime instead. This lens is much better in the corners than I saw in others and, since it still has a nice max f/1.7. I still get that low-light benefit and shallow depth of field to produce some nice Bokeh. It doesn't have any stabilization so it's not so great for handheld video but it has definitely improved my photos not only due to the max f/1.7 but also forcing me to get a different perceptive with the fixed focal length. Rated 5 out of 5 by Hunter from Sharpness and Len Speed a Real Asset The kit lens with the G7 does a nice job when there's ample light. 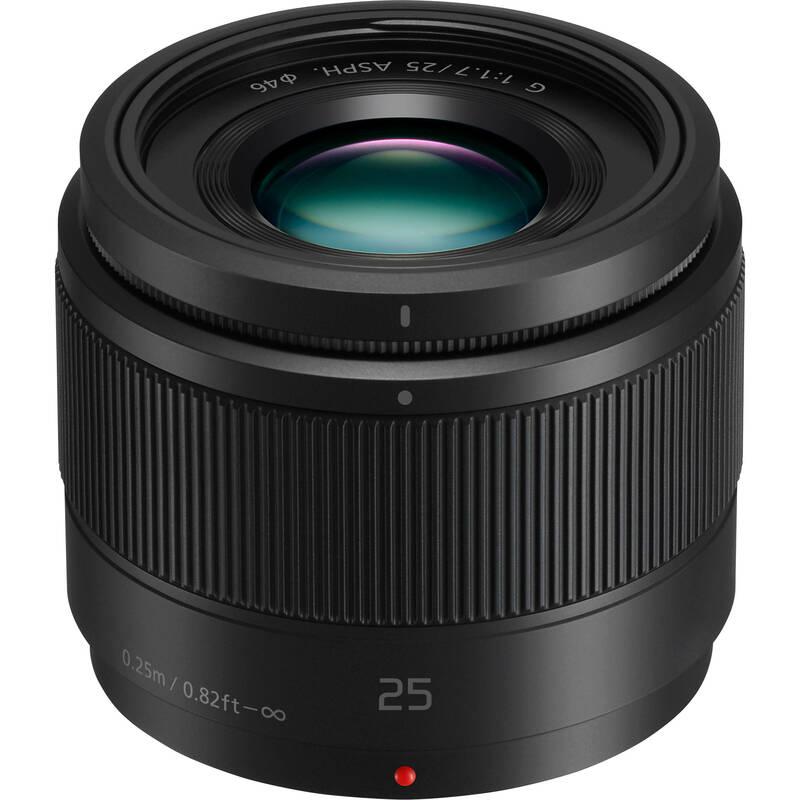 The Lumix G 25mm f/1.7 lens opens the door to new possibilties in less than idea conditions. I've been photographing time lapse of moonflowers which open just after the sun sets. The sharpness and speed of this lens allows me to use a reasonable ISO of 800 and have the ability to capture the entire process of the flower blossoming in fading light. It's speed allows me to use fast shutter speeds when trying to capture blossoms in daylight when there are breezy conditions. I'm pleased that this kind of lens was in my price range. I believe it will a lens that I often use. Rated 4 out of 5 by thejkhc from Great deal. Good lens. This lens for the price (got it during the $ sale). Is a great piece of kit for m4/3 shooters. It comes with a lens hood too! Which olympus really ought to do. Anyways i digress. The lens itself the image quality is very crisp. I haven't noticed much softness or vingetteing at the corners. However, wide open the lens suffers from colour fringing along high contrast edges. The bokeh is very smooth with only ever a few moments where it seems strange. But it isn't choppy like similar lenses in this price range from the Traditional APSC dslr camp. The build quality is adequate. It's a plastic body with a metal lens mount, but i forgive this because it's an internal AF system. So no fiddly bits that can get crud stuck inside. Rated 5 out of 5 by Carl from For the price... unbeatable. Great for Stills. Pretty good for video. Not a fan of the focus by wire, but that's the thing nowadays w these low budget native lenses.Very sharp w good color rendition. AF is as fast and accurate as you need it to be in 95% of situations. Lightweight and compact. And hey Panasonic, THANK YOU for including a lens hood. Nothing remarkable about it, but gets the job done quite well for the budget price.No doubt a dependable choice for vloggers, etc. But I personally prefer something like the feel, character and manual pull of a vintage lens. Still, happy to have it when I want that auto-focus and full electronic capabilities. Rated 5 out of 5 by Vincent from Great budget prime lens!! Great prime lens for a great price. I was looking for a 25mm (nifty fifty) for my MU4/3 system and was waiting for this to come out. I did not want to compromise the DFD focusing speed and this lens delivers, and focus as fast as I can frame a scene. However, you can hear the shutter/focusing mechanism in a very quiet environment, but very faint. The construction is similar to the new pany 42.5mm f1.7. The texture is matte and nice to the touch but feels very plastic but seems durable, which is fine for me as I would not want any extra weight in my bag, so it's great for travelling. However, it is still larger than the Oly 25mm or the Pany 42.5mm f1.7, especially when the lens hood is kept in reverse. Sharpness is great for a 16mp sensor, and I don't have to explain how versatile is the 25mm (or 50mm) is for general photography. Attached below are some sample pictures. CA control is good and no purple fringe not that noticeable. Personally, the aperture of 1.7 or Oly's 1.8 range of prime lens is just nice for open wide for bokeh effect. Not too soft and just enough subject separation. Overall great bang for buck and it'll stay with me for a while! Rated 4 out of 5 by Nelson from Good lens at great price I bought it while it was on special to compliment my Olympus 12mm. This lens is pretty light but only slightly smaller than Leica version, which is a bit more bigger than the Olympus 25mm 1.8 version. It is plastic fantastic construction but with metal lens mount. Performance wise it is pretty good given the price, give much nicer bokeh than the kit lens, CA seems slightly better than Leica version when full open, focus is fast and silent, but against flare it doesn't seem do to well compare to kit lens. So if you don't have Leica or Olympus version this one is well worth it consider the price advantage, even though it is bigger than Olympus in terms of volume but it is actually lighter. If we already ordered the lens (now that it says currently unavailable) will we still be receiving it by the time frame previously stated? I apologize, but this type of request cannot be taken care of through this feature of our website. Please contact our Customer Service department by entering Live Chat, emailing directly to cs@&lt;a href= http://bhphoto.com, target= _blank &gt;bhphoto.com,&lt;/a&gt; or calling us toll-free at 800.221.5743.
is this lens compatible with the new Lumix GX9? I pre ordered this item,what does it mean This item is backordered by the manufacturer ? Backorder means that the manufacturer has halted shipping of this particular item temporarily, so the item is not available at that time. However, you can sign up to be notified when this lens comes back into inventory by clicking the Notify When in Stock link on the product page. Will the promo-backorders made in December (for $99) be fulfilled now that the lens is available? Any new firmware for this lens? This consumer lens does not need firmware. Answered by: Dennis A L.
Does this lens feature Mega OIS or what, I don't see any indication of optical stabilization? No, the Panasonic Lumix G 25mm f/1.7 ASPH. Lens does not have image stabilization built into the lens. when will the stock coming? Hello, just ordered it, when it will arrive to USA ? Hello, just ordered it, when it will arrive?